I've gotten a few Christmas cards already and I love them so much as well as the little reminder they are providing me that I should probably get a move on with my own. This first one is from the super fabulous blogger extraordinaire, Allison. She is the girl in the "know" on the web when it comes to all things stampy. 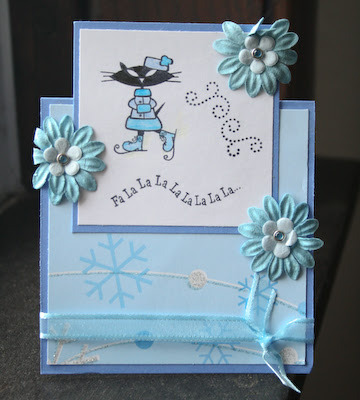 Love all the flowers on this card and the little kitty with the evil eyes on skates made me giggle. Thanks for letting me know it got there! Xmas Kitty, what a lovely idea. Love this beautiful card. such a cute card, love it! !